One of the world's oldest and strangest geological formations, unique to this area of the Guyana Highlands. An ecological island plateau, cut off from surrounding country by a vast drop on all sides, which inspired Conan Doyle's Darwinist classic, The Lost World. Extraordinary combination of erosion sculpture, sink-holes and quartzite caves, and flora and fauna so unique it is described as The Galapagos of the skies. Superb views down across the surrounding plains when the cloud allows. Though not great in distance from the start-point, this is a tough walk - with very demanding ascent and descent - in remote, inhospitable country. Guiding is essential, especially on the mountain-top. It is often very wet here - Come prepared. ANYONE GOT ANY GOOD PICCIES? WE WOULD BE DELIGHTED TO GET THEM! Note: Negs: a very tough climb to the top; frequent cloud cover and rain. 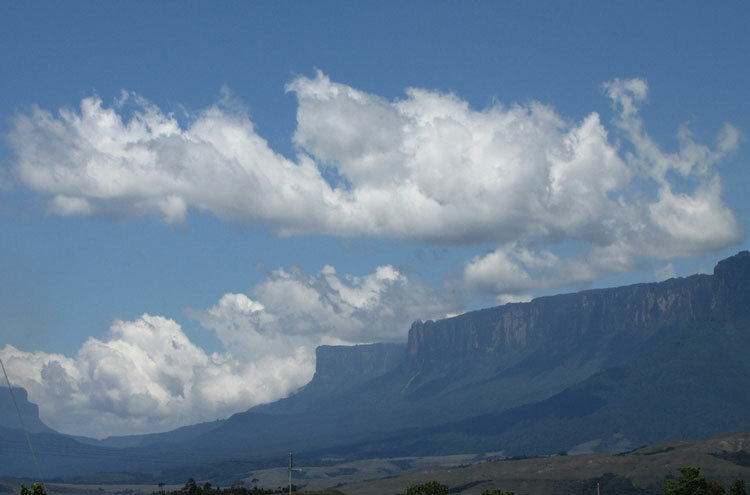 Monte (Mount) Roraima is the largest example of a geological formation known as a tepui, or tepuy. 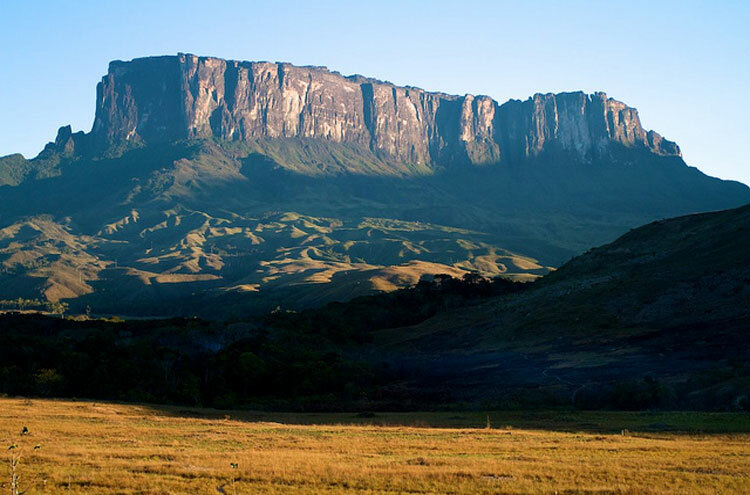 Unique to the area of South America where Brazil, Venezuela and Guyana meet, these waterfall-covered table-mountains were formed by seabed erosion after the breakup of the supercontinent two billion years ago. Their sheer-drop cliffsides have preserved their topland mesas in magnificent isolation from the surrounding forest and grassland, resulting in ecosystems that, like the Galapagos islands, are unique to each mountain. 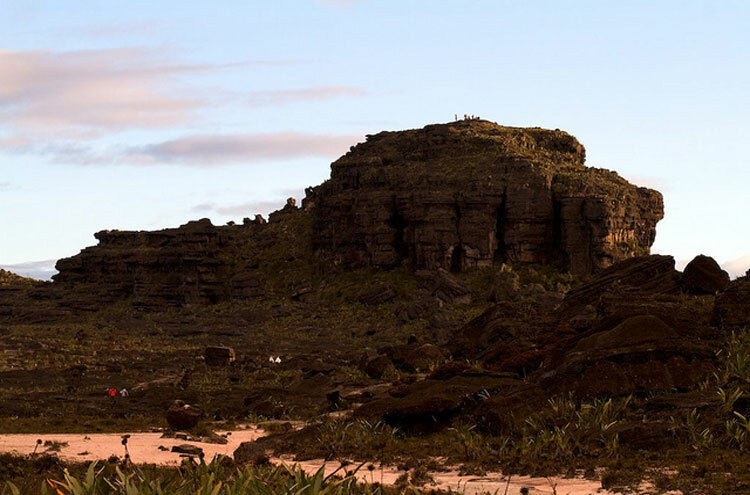 It's reckoned that 50% of the flora and fauna of Roraima is not found anywhere else. 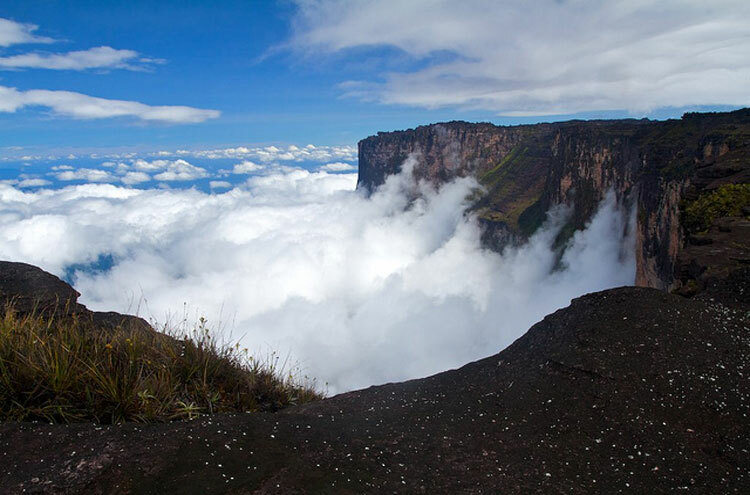 Nearby, the Auyantepui is the site of the world's highest waterfall, the Angel falls. This nearness, of course, is relative. 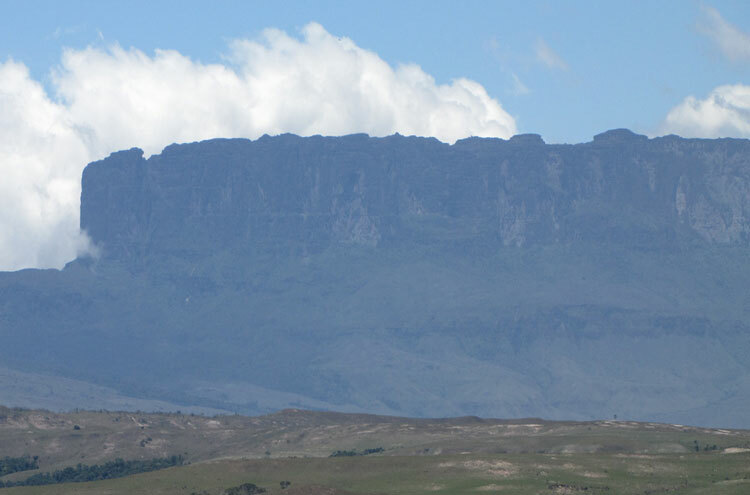 The Gran Sabana is the size of Belgium, and has only one proper road in the whole region. Any movements are necessarily laborious and require the use of boats, 4WDs or old-fashioned foot-slogging. 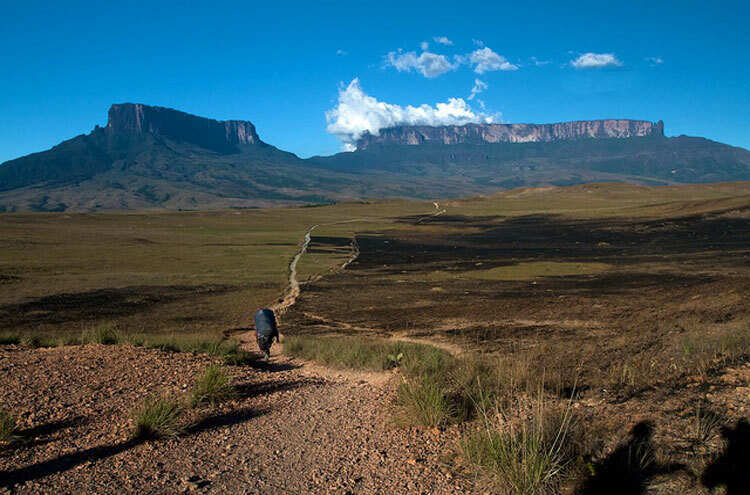 Roraima's top, an object of religious veneration among the indigenous Pemon people, remained untouched by human foot until 1884 when the redoubtable Everard im Thurn braved the ramp-like route still used by walkers today. It has since been a source of fascination for biologists and artists alike. Reports of its exploration formed the basis for Arthur Conan Doyle's much-filmed dinosaur classic, The Lost World. More recently, the tepuis's unique ecosystems formed the basis of spider-shocker Arachnophobia. Although most of the mountain is, in fact, in Guyana, im Thurn's route is the only trail that does not require technical climbing skills. And a tough walk it is: though only roughly 70km on paper from the starting village of Paraitepui, the surrounding grasslands are hot and shadeless, with bridgeless rivers to negotiate, and the ascent itself a gruelling, muddy ramp including waterfall-showers and vine-rope-pulls up a vertical cliff-face. Expeditions tend to allow for six days all-in: two-and-a-half to the top, one-and-a-half on it, and two for the return. The first sight of the peak, after the uphill travails, is often rather disappointing. 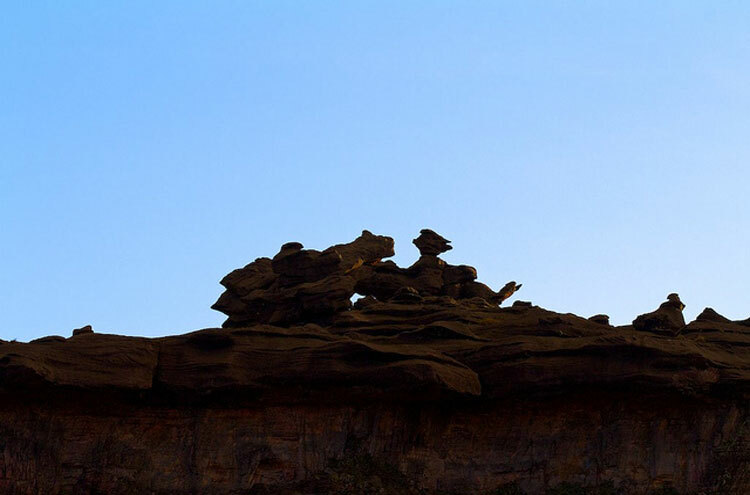 Cloud regularly cloaks the mesa: be warned, it rains here a great deal more than it doesn't, and the infertile sandstone environment seems barren and featureless. 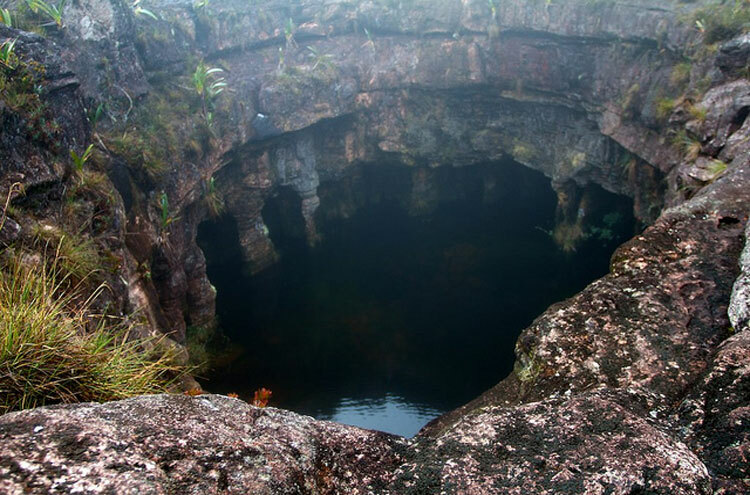 Exploration reveals a wholly different state of affairs, however, for Roraima shelters unique and stunning features - an entire plain of crystals; water-filled sinkholes of collapsed supercaves, which are like swimming in giant brass bowls; swathes of pink sand; precipitous gullies that vanish into darkness; and a host of orchids, carnivorous plants and reptiles that, some of them, pre-date the dinosaurs. A tiny black frog, for instance, which has no foot-webs, cannot swim and does not pass through a tadpole stage, is genetically related to African frogs; their ancestors last saw each other billions of years ago. 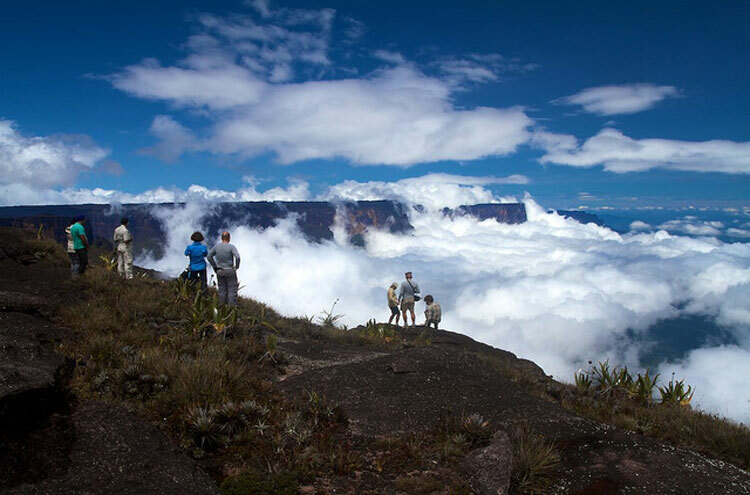 Roraima's inhospitable tabletop is a Darwinist dream; and, when the clouds lift, the views across the great green striding plains of South America are breathtaking. Nights on the top are spent in nicely-named hoteles - cave-overhangs which provide some shelter for tents. Guides are essential here, as this is dangerous terrain and easy to get lost in. Spend a couple of exhilirating days exploring, then return by the same route. ANYONE GOT ANY GOOD PICCIES? WE WOULD BE DELIGHTED TO GET THEM. "Conan Doyle was misinformed regarding Roriama. 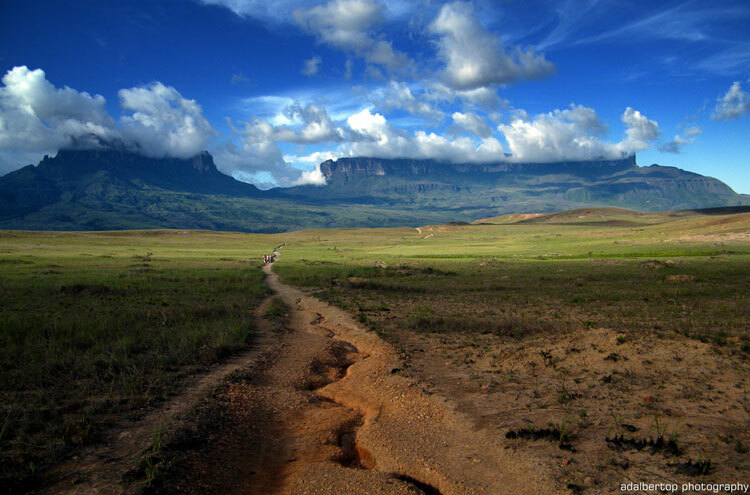 The district of Roraima where Indians snort a delightful hallucinogenic snuff, is actually 400 kms south west of the peak in Brazil. I climbed the peak in 1983 with a guide. Went hypothermic on the ascent and starved throughout the 5 day venture. Mind you, there is an amazing quartzite cave which lights up like a giant chandelier at dawn. The entrance is marked by a sentinel shaped like a tortuga- or turtle. I also think that the environment was described by Koestler as the habitat for the exqisite midwife toad. I did not see one when on the mountain but if I had, I would have eaten the toad without guilt or compunction."